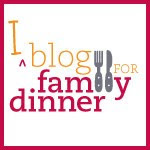 Mark Bittman posted a column on Babble last week with 5 tough-love tips for parents who want to make family dinner a priority. I agree with his sentiments, but several commentators, rightly, pointed out that his list didn't actually include any helpful tips for how to get dinner on the table quickly, night after night. Many cooks swear by menu planning as the answer to making sure family dinner happens every night without fuss. The basic instructions are simple: 1) take time on Sunday to plan for the week, 2) use your plan to create a shopping list, 3) stick with the plan through the week. The Menu Plan can help you be organized and maybe even get a jump on prepping for some meals ahead of time. It can also be a platform to get your partner and older kids to help out. If everyone knows what is on the menu, tasks can be assigned beforehand, so that they can chip in. Older kids can be taught to wash vegetables or start the water for pasta when you are on your way home, for instance. I found two videos on menu planning that were so funny in contrast to each other. The first shows a regular mom who happens to live in New Zealand. She swears by menu planning as a money-saver; that's another bonus. She eschews paying a menu planning service (that are abundant on the internet) and just opts for a simple printed chart tacked to the frig. Low production values, but very honest, real, and practical. The second video is pure fantasy. Put together by Parents magazine with sponsorship (Bertolli says make pasta, pasta, pasta! ), the production values are better: nice shots of well-groomed kids and mom (an actress?) in kitchen and grocery store. She, too, is basically describing a piece of paper that becomes a menu plan and a shopping list. The fantasy part is that the kids are so helpful and that there's time to let them help with the shopping, help with the meal prep, and you can even boost their writing skills if they write the list for you! Kids can definitely pitch in: setting the table, clearing the dishes, and during well-planned and practiced food prep. But having kids help is not really a time- or work-savers as any cooking parent knows! It's teaching them to cook which is valuable, but not often possible in a time-crunch situation. Still, it's a good idea to involve kids in the planning; each kid can recommend a dish for the week and then you plan how they can be of help with actually cooking it. Realistically, this can probably happen once a week, depending on the age of your kids and the time frame you have between getting home and making dinner. (Maybe Friday night or a weekend meal is Kid's Choice night.) Similarly, the trip to the grocery store is cute, but also pretty laughable in reality. Unless it's a trip to the farmer's market or a health store, the kids may sabotage your healthy pantry and your budget! Do you menu plan? Feel free to write in with your own menu planning tips. Orgjunkie.com also has some great menu planning tips under Menu Plan Monday.